When GNC was burdened with a damning investigation, Archbold saw an opportunity to unite the entire industry. That notification, and much of what happened in the following months, sent Archbold on a mission for industry reform that reshaped how retailers, producers and trade groups approach product transparency. Archbold had stepped in mid-2014 after a successful customer experience and financial performance turnaround for women’s clothing retailer Talbots (as well as executive positions with many national retailers including Vitamin Shoppe). GNC brought him on as they experienced slowing sales growth, and stock value began to grow immediately. On July 28th, 2016, days before his second anniversary at GNC, Archbold was replaced due to decreasing revenue. The NYAG investigation and resulting compliance and transparency efforts formed a dominant element of his tenure with the company. Part of the agreement was that the very same lot numbers called mislabeled by the AG’s office were put back on the shelf after being proven—by way of more appropriate chemical assays—to be satisfactory. Instead of fighting the AG, however, GNC continued to comply and embarked on a mission to build in the kinds of safeguards that would have prevented the whole NYAG controversy from happening in the first place. Those safeguards included clarifying standards of identification and outlining GMPs for botanicals (accelerating an ongoing AHPA effort) and eliciting input from throughout the industry. The bold moves were applauded. But perhaps not in the GNC boardroom. It’s an expensive stool (with the first leg being both the most important and most expensive, says Archbold). But, he says, “I think not having those things would be an even greater cost.” A tough decision to make as a new CEO of a struggling company. GNC also built partnerships across multiple strata of the industry, working in project partnerships not just with AHPA, but with NPA, CRN and UNPA, too, to create standards for identification and GMPs, especially for botanicals. “A challenging time” might be an understatement. 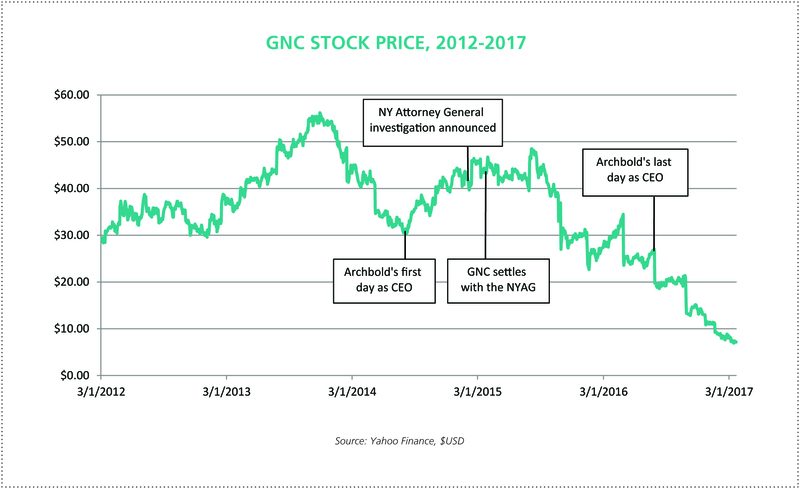 Archbold’s initial gains in GNC’s stock valuation flattened during the investigation and began to disintegrate in September of 2015, hitting his GNC career low in July of 2016. At that time, the company reported second quarter consolidated revenue of $673.2 million, a 2.4 percent year-over-year decrease. Same store sales decreased 3.7 percent (and 6.6 percent in franchise locations). Steinford sees this, too. “The discussion that Mike forwarded is going to continue to evolve for years to come,” he says.